Our portable mixers are grouped in our DMX Line. We break these portable mixers out of the DMX line in order to highlight some of our unique designs. Portable mixers have long been the workhorse of many process industries. Applying these mixers in pilot plants or in plant mission critical applications these portable mixers offer the power and flexibility to suit your application and environment. 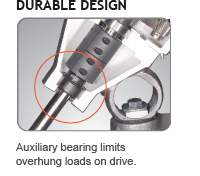 When buying a portable mixer you are investing in torque and the construction to handle this torque. 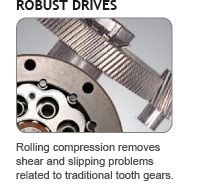 This is why we offer one of the widest ranges of gear reduction. (5:1 – 21:1) (350 – 83rpm) with our portable mixer line. For heavy applications, we offer our Heavy Duty Portable DMX Mixer models. These mixers can handle shock loads that are greater than 500% of their rating. This is the reason industry selects Dynamix when process downtime is costly, or when a process just can’t fail. Portable mixers auxiliary bearings are the difference between an economy portable mixer and a portable mixer designed for long term use. Do not let your mixer supplier rely on the bearings in the motor. Dynamix uses auxiliary bearings in its DMX Portable Mixers in order to isolate loads from the motor. This allows the motor to run efficiently and without damage. 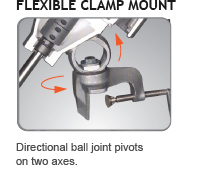 This unique ball joint configuration enables the portable mixer to rotate through the vertical and horizontal axes. This flexibility enables it to be used on different tanks and applications to address varying flow patterns and dead spots. Impeller selection is the starting point of any mixer configuration. Starting with the right impeller means your portable mixer will work in balance and provide quality mixing. Issues such as uniformity, area of influence, shear, solid suspension, and many others are addressed by the impeller selection. IMPELLERS – DynaFlow, P4 Pitch, Radial Full range of impellers enables us to provide a mixer specifically suited to your application. Note: we do not have one single model for portable mixers, we have mixers to suit each type of tank and configurations to address all the challenges of industrial mixing. If you are unsure of your application or tank design just contact us directly or submit our request for quote with the information that you have.